One, Two or Three Short Triathlons at Maho Beach. 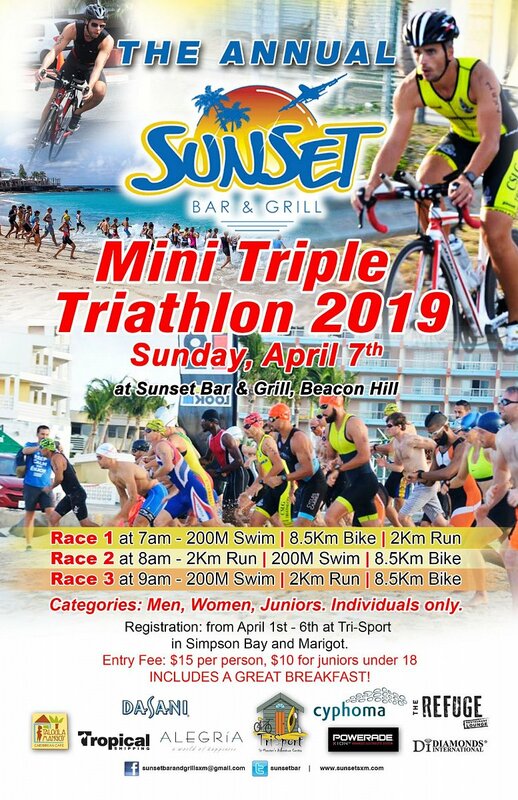 The annual Mini Triple Triathlon offers something for everyone! Whether you are trying your very first triathlon or are a seasoned athlete, you will find a fun challenge on March 18th. The event consists of three short triathlons at 7am, 8am and 9am, and you can choose to do one, two or all three, however prizes will be awarded only to the participants who complete all three races. Bike - 8.5Km - Exit from Sunset Beach Bar and turn left passing Maho Beach to the roundabout at Maho, then turn right to the airport, turning at the roundabout with the Pelicans. Head back to the Maho Roundabout. On your third turn at the Pelicans, you will be heading back to Sunset Beach Bar. Run - Exit the Sunset and turn right into Beaconhill. Continue along the road, keeping right until the roundabout at the point of Beaconhill. Run around the roundabout and return to the transition at Sunset. 3) Numbers must be worn at the front when crossing the finish line. If the time keepers cannot see your number, you may miss out on having a finish time. 5) Count your own laps on the ride! Our volunteers are not responsible for counting your laps, only noting down your numbers to be sure you have completed the three laps that are required. 6) Smile and have a good time! Any aggressive or disrespectful behaviour will result in Susy's wrath!